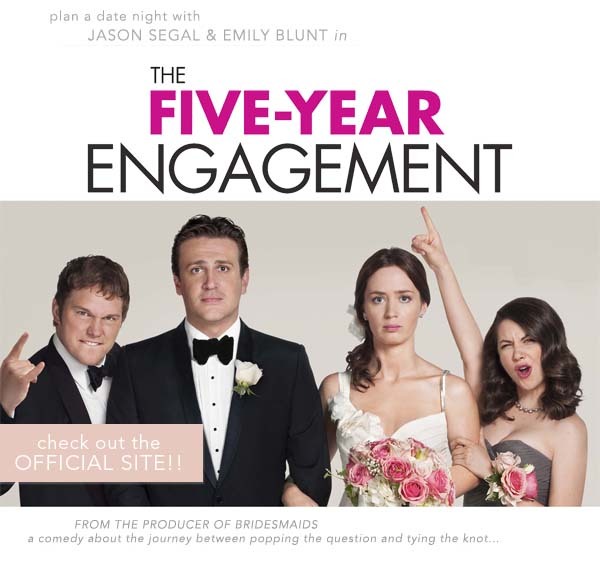 When Tom (Jason Siegel), a successful up-and-coming chef in San Francisco proposes to the love of his life, Violet (Emily Blunt), they both assume they will get married, stay in their hometown, and live happily ever after. But when Violet gets an acceptance letter to the University of Michigan for a 2-year doctoral fellowship in experimental psychology, Tom, being the supportive fiance, moves with her to Michigan. Since San Francisco is one of the few towns in America where chefs go to get noticed, Tom feels like he's giving up his dream for the sake of Violet's, especially when his quest for an executive chef job in Ann Arbor results in accepting a job at Zingerman's Deli instead. Soon two years in Ann Arbor turns to four, and as they continue to postpone the wedding until they can move back home, Tom's resentment towards Violet builds to a comedic madness. Will Tom and Violet ever get married, or will their continued time in Michigan cause them to grow further and further apart? When a friend of mine told me that the movie The Five Year Engagement takes place in Ann Arbor, I knew I had to watch it. The premise behind the story didn't interest me so much as the hometown setting did. In fact, I'm fairly certain I never would have watched this movie had it not been for where the story took place, as all romantic comedies seem to have the same storyline these days. There was a handful of funny, laugh-out-loud scenes but I have to say, I was quite irked at the way my beloved Ann Arbor was portrayed in this movie. I might just be an unsophisticated Midwesterner, but the way we are often portrayed by people from more cosmopolitan cities like New York, L.A., and San Francisco is quite one-dimensional and "lesser than." I felt that same sense of superiority from the creators of this movie. For being "just a Midwestern town", Ann Arbor is very sophisticated, intellectual, and has quite a diverse and exciting food scene. Despite the fact that we will never be able to compete with cities like New York and San Francisco, I love that we are a small town with a "big city feel". There are many exciting things happening on the food scene in Ann Arbor if people would just bother to look. Given that Zingerman's is a nationally and internationally known delicatessen, I was surprised at how inferior they were made to appear, and many of the well-known, real-life, downtown establishments were treated with the same disrespect as a montage of fictional Ann Arbor chefs and owners laughed in his Siegel's face and called him #@%^&*! crazy for moving to Michigan from San Francisco. Granted, much of this attitude has to do with Siegel's character's own perception and resentment of having to give up his burgeoning career to move to Michigan, but the creators of this film never did anything to right that perception once *spoiler alert* Tom came to his senses about his and Violet's relationship. Despite my distaste for making Michigan a punching bag in this movie, it was still an entertaining storyline that kept me laughing throughout. Still, for as much as I love to complain about my home state, it's a lot like siblings: you complain about them, call them annoying, and tell them how much you hate them, but when someone tries to mess with them, you will do whatever it takes to defend their honor. That is exactly how I feel about my home state, and that's why I spent a great deal of time annoyed while sitting through this movie. Oh I didn't know that this took place in Ann Arbor or featured Zingerman's. I grew up outside of Toledo and know AA well (or used to). I hate, hate, hate the incessant belittling of the Midwest, especially a town like Ann Arbor with an international population and the intellectual stimulation from the university. On the other hand, the movie features Ann Arbor and Zingerman's, so you know I'll have to watch it. Sounds like a nice watch. I'll look out for it. Good for you defending your home state! I had seen the trailers for this movie when it was released, but I never did get around to seeing it. I do like Jason Siegel, maybe I'll give it a look. I don't know the Midwest..but I love Zingerman's. sadly only by mail order. Yes! Some people think I'm nuts, but there are certain things like my city, state, whatever that I act like it's a sibling. Not to be weird, but you get what I mean. Do NOT insult them because it's a personal matter to ME. I can gripe, you cannot :) Sounds like a cute movie! The movie does look funny, but I understand your frustration. Wonder if the city of Ann Arbor was sorry they let them film there?! Personally, I love MI. and would move there in a heartbeat!